I was quite a bit disappointed with Catalyst. I loved Control so much that it physically hurt to see my expectations fall by such a wide margin. To be fair, Lydia Kang is still just as amazing with her integration of science in her writing. I loved how Zel’s mind works, and in this next and final installment, many obstacles are thrown in her path which really developed her into a better character and person. From having to act as fugitives in their country to fighting off a new Aureus-like House, it wasn’t like there wasn’t anything happening with Zel and her friends. The disappointment first stems off with Cy. After that conclusion in Control, let me just say that I totally hadn’t expected so much distance with him. Oh, and with another girl too thrown into the picture. Don’t worry, it’s not what you think (not a love triangle), but there’s definitely a wedge in their relationship after the year long separation and Cy seems fond of this girl. Yeah, he eventually lets Zel in after realizing he couldn’t “protect her from worrying about him”. I would just like to tell him that he’s an idiot and should’ve realized that Zel would worry twice as much from the added distance. Boys. They can be so naive. And yes, there’s things to worry as Cy is displaying Ana-like traits. Freaky! Or not, ’cause it’s cool to receive air kisses and hear his voice in your head, whispering sweet nothings (or poetry). Unfortunately, it’s not as romantic as it sounds as the story never really goes into depth on their relationship, just somehow sliding back into place over time. I swear, it never even explains what happened that brought Cy and…the girl so close. Granted, I skimmed through a lot of this book (I was too saddened by my expectations slowly crumbling to read as slow as normal) so there may have been a few things I missed, but Catalyst is definitely not heavy in the romance department, unlike Control. I will say that I loved the usual family dynamics with the rest of the Carus House members, and even seeing some redemption in former Aureus members. This story may not be considered a romance, but at least it stayed true to other themes like character development and learning to survive in a world that deems you illegal. The ending was solid, in my opinion. Whatever problems I had with Catalyst, I think Kang did a wonderful job in choosing her conclusion. It was realistic and not some magical happy ending (it’s not sad, either, so don’t worry), but it held promises left up to the imagination of what may happen next to our favourite group of genetically manipulated friends. Not everything is answered. In fact, maybe there were more questions that popped up, but as Zelia even mentioned in the epilogue, some things may never been understood but you can choose to be happy or remain disatisfied with the unknown. I love Lydia Kang’s writing and the science. So maybe this was just my own disappointment leaking into a biased view. 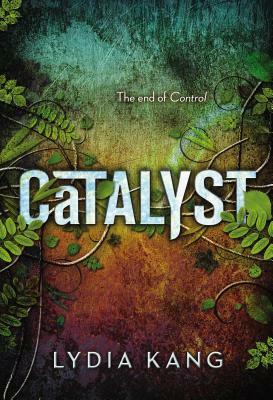 Either way, Catalyst was unexpectedly surprising and still worth at least a primary read. Control was by far my favourite sci-fi book that actually integrated accurate modern science into it. So with such high expectations come a downfall with Catalyst. Not so much a romance as Cy and Zel’s reunion was definitely NOT quite a happy one, the story still presented with action as the Carus House members are separated and chased by the society they live in. Zelia really grows in this story, finding in herself to take charge while all the same, remaining compassionate and forgiving to people even I would reconsider forgiving (and I like to think that I’m a rather nice person…). With that being said, don’t take my low rating as “it’s terrible”. It just wasn’t for me, but it may be a decent read for you.